With rising temperatures, leaves in full green splendor, and built up energy from a winter spent indoors, summer is an amazing time to get outdoors and enjoy the trail. While your first idea might be to head to the beach or relax around the neighborhood pool, we encourage you to consider spending time this summer doing something that will have a lasting, positive impact- on your spirit and on the environment. 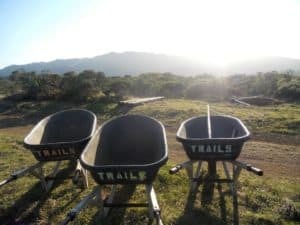 During American Hiking Society’s “Summer of Service”, we are offering numerous week-long trail stewardship vacations that combine outdoor adventure with rewarding environmental conservation projects that contribute to the sustainability of our nation’s trails. The tan of a beach vacation will fade, but the satisfaction of a week spent in the woods, nourishing the soul with nature, good people, and physical activity will last forever. To light your path on future summer adventures, all participants in the following trips will receive a Goal Zero flashlight (in addition to the awesome Volunteer Vacations T-shirt)! Will you GET OUT and GIVE BACK with us this summer?